Imagine being a single, middle-aged man who can neither write nor speak but is perfectly average in every other aspect of his life. 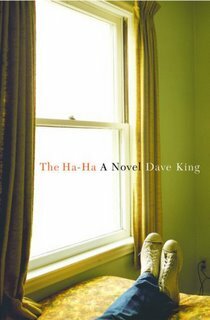 The reader is introduced to Howard Kapostash as he assumes responsibility of looking after nine-year old Ryan, son of his ex-girlfriend Sylvia who is being sent away against her will by her sister into a drug rehab program for an undetermined length of time. The sister takes care of the cat and Howard takes care of the boy who is not his son. Howard can’t communicate due to a severe head injury that occurred sixteen days into his tour of Vietnam. He returns home to his mother and father a broken young man who can’t communicate and is unwilling to try even though the mere fact that he survived such an injury is considered a miracle. The book is told from Howard’s narrative and it’s an amazing story that unfolds to the reader because you learn in flashbacks why Howard never really moved forward when he returned from the war and how he lived in a self-imposed solitary existence with his parents until each of them passed away thus forcing Howard to take on borders in his parent’s house (now his home) to help pay the bills. There’s a young Vietnamese-American woman named Laurel who makes gourmet soups for a living and two housepainters named Nit and Nat (so named because Howard finds bother irritating and never makes an effort to learn their real names). The sheer beauty of this book is the way Howard and Ryan learn to interact with one another and how the introduction of this boy completely changes the dynamic of all the tenants living in Howard’s house. But the frustration of the book is the reader clearly sees how manipulative and self-centered Sylvia is from the first pages of the story. We can’t imagine how such a good man like Howard could still be carrying a torch for this woman who continually insults him and takes advantage of his feelings to get him to do things for her that she doesn’t deserve—especially since she entrusts the care of her son to him and the care of her cat to her sister. The satisfaction of completing The Ha-Ha is that you survive the journey right alongside Howard. The author Dave King does an impressive job at showing the dark side of Howard as he learns to deal with just what his injury has cost him in both his present life and the life he could have had were it not for being sent to Vietnam. In the end, this book is about relationships. It’s about how one person can come into your life and completely change the way you exist. It’s a love story between a fatherless boy and the man that could have been such a good father to him had things been different all those years ago. It’s a story about a man finally waking up to his life and learning that there are always possibilities around the corner if you’re looking for them. I highly recommend reading The Ha-Ha. It’s one of the best books I’ve read in 2005 and you’ll walk away feeling a new appreciation of just how important words can be—in any form. Provided by Management for your protection. You'll probably feel this is T.M.I. (too much information), but I have to admit that I'm not one of those fussy women concerned about germs in public restrooms. I reason there is no need to take precautionary measures such as using toilet seat liners because I would never use a restroom that looked so sketchy that I needed to use accessories to protect myself from germs. My place of business is clean and sanitary and the patrons of the restroom on the floor where I work all seem perfectly fine to me. I just don't like toilet seat liners. To me they're just another opportunity for irritation because inevitably someone forgets to flush them. Why do I constantly find myself walking into a stall with one of those liners haphazardly askew on the seat calling out for my attention: Flush Me! Flush Me! Now that's when I think "Ewwww" and move on to the next unoccupied stall. I flat out refuse to use them. But when you sit on the toilet in a public restroom, the toilet liner dispenser is mounted smack center on the door in your direct line of vision. So today at work I noticed a little sign printed on the dispenser: Provided by Management for your protection. I have previously written about how impressed I am with automatically flushing toilets and water faucets with auto-dispensing soft soap. That little phrase about management providing toilet seat liners for my protection just kind of made me laugh this afternoon. I'm thinking my employer may wish to consider protecting my sense of dignity instead. I would like to propose automating this whole toilet-seat liner business entirely because I've seen the future AND it works. This is a picture of something called a Sani-Seat. I first experienced it when I went to an Anne Murray concert at Mohegan Sun in Connecticut at the end of November. (Stop laughing! Snow Bird is classic) It's the coolest little automated device because you're forced to use the liner. Upon rising up off the seat, the Sani-Seat immediately replaces the used liner with a fresh one. Simple. No thought involved by you. Just zip up or pull up and go. This automated process eliminates stray used liners forgotten on the toilet to be flushed. There's no mess on the floor because such a paper thin liner blew off and landed on the floor when someone swung open the door to leave the stall. I like to reason this way because I'd hate to think there are some people simply too lazy to pick up the liner off the seat and dispose of it properly so they leave it there for the maintenance worker to remove. Why should they have to pick up these orphaned liners? It's bad enough that they have to do all the other unmentionable maintenance involved in keeping a women's bathroom spring fresh. They shouldn't have to flush for us, too! So that's my bathroom rant of the day. 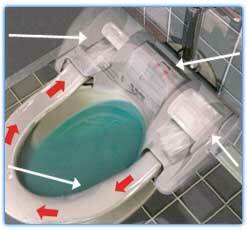 I propose auto-dispensing toilet seat lining for all corporate offices. Next on my agenda is figuring out that little lock-box that is built into the wall above the toilet of the first stall in the bathroom at work. Why only the first stall? Why are the toilet paper holders locked? Who randomly puts a bottle of Suave moisturizer in the ladies bathroom? I've got too many questions and too much time to think. I better lay off the bottled water. Is It Live or Memorex? 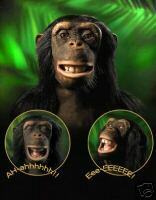 It seems animatronic Chimpanzee's are all the post-holiday rage. It all began with the original Chimp sold by Sharper Image. My co-worker Andrew absolutely loved downloading the demonstration video showing both sight and sound features of this modern marvel all the way down to life-like chin whiskers. If he ever needed to interrupt the droning silence of work or lighten the mood of the office--he'd play the Chimp video and crank the volume. It always guaranteed a laugh. As we approach February, I thought it might be a good time to check the clearance section of the Sharper Image website thinking I could get this toy for a great price--like fifty bucks. No such luck. "Alive" Chimpanzee has left the building. 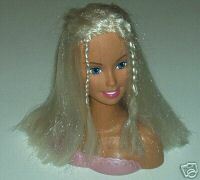 However, it's still being sold on Ebay at the princely price of $160.00 which is too rich for my non-anthropoid blood. Never one to give up on a good hunt, I've discovered that my Chimpanzee has already evolved---into a much cheesier and paler version of the original. WowWee is about to release their own chimp and boy is he ugly. The facial details are so bad that he looks like a Chimpanzee with a crack cocaine addiction. Where's the supple skin? Where are the beautifully detailed glass-like eyes that shine brightly and make you feel guilty for looking away? I encourage you to compare both Chimps to discover what I already know--there is simply no comparison! I guess the weird thing about this Chimpanzee head is I can't see who would want something like this other than office folks like myself who simply enjoy a manic burst of laughter now and then. But what really fascinates me is how someone invented this toy in the first place. Were they going through the attic one day looking at their old toys and came across one of those Barbie Stylin' Heads from the 70's and thought, "Hmmm. What if we used a monkey instead of a human?" I am a Supply Planner at Bose in Framingham. Most of my friends have no idea what I do and when I attempt to tell them in my own words that I "...translate the Sales and Operations Production Plan into a time phased supply plan while executing schedules in a manner that factors capacity constraints with working capital goals while lowering the product cost through efficient production so that product is available, on time, to meet Customer needs, fabrication needs, or internal needs..." they get all glassy-eyed and translate my job into this: Kim works for that company that makes that expensive Wave radio advertised alot in Parade magazine. So this is why I LOVE the Nextel commercial shown here. In a nutshell, this is my job minus all the spreadsheets and analytical process. I make sure the products are available for the customers. Everytime this commercial comes on, I have to rewind it on the DVR and watch it at least two times. It is brilliant. Tomorrow is indeed a special day for me, but it's not because it's my 36th birthday. My co-workers are taking me out to lunch to celebrate my birthday at Ruby Tuesdays and we're topping it off with a Two Buck Chuck run to Trader Joe's. 'Course they are quickly finding out that I must have been living in a cave all these years because I didn't have a clue as to what they were talking about. I know they picked the restaurant because there was a Trader Joe's next to it. 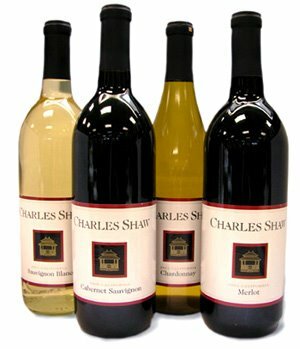 They patiently explained to me that Charles Shaw wine is exclusively sold at Trader Joe's and the wine tastes really, really good. Some of them were just baffled that I had never heard of a Two Buck Chuck. Now I'm no drinker. If you opened up my cabinet, you'd see a big bottle of Midori and a newly acquired bottle of Anisette (Thank You Katie!!) along with a large bottle of Parrot Bay rum. That's about it. I don't like beer or champagne. I stick to what I know and wine is too complicated. I get weary of bottles that I can't just screw off or flip off with a bottle opener. Cork Screw? Forget it. I don't even think I own one of 'em. So I'm going to have to add one of those to my shopping cart tomorrow. My co-workers tell me that it's not uncommon to just go into Trader Joe's and buy a whole case for $35.99. That's a boat load of wine for someone like me who gets a buzz-on from a wine cooler. I'm the kind of drinker that looks for the rebates on a 4-pack of Bartle and James....pathetic, I know. In fact, to further drive home their suspicion that I've lived in a cave all these 36 years--did you know that a Roy Roger was the 'boy' version of a Shirley Temple? Seriously...who knew? I tried to defend myself by telling them that being an only child didn't allow for many social outings with boys who would want the masculine version of my ginger ale with grenadine juice. But here's the thing. I made a mini-resolution that this would be the year for me to try new things and imagine possibilities...I think this Two Buck Chuck run is a great way for me to start off my 36th year. Next on the agenda...my first hangover from a cheap bottle of Chuck. He's MY Weatherman for LIFE! At some point in December, Channel 7 (WHDH) decided to get rid of the amazing Todd Gross. He was their chief meteorolgist after old Harvey Leonard moved onto to greener pastures with Dickie Albert. I'm not sure why Todd was asked to leave, but regardless it was a huge mistake in my opinion. But here's the great news! He's back on his own terms with an evolving weather website for all of us living in New England. I implore you to tell your friends, family and co-workers about ToddGross.com. I've also subscribed to his RSS Feed so his daily forecasts will be posted on My Yahoo. Screw that annoying little chirpy Weatherbug application that will only clog up your computer. Say good-bye to any other weather websites out there. I don't know where the man is getting his weather models to do the forecasts, but he's doing it and I'm supporting his endeavors. You can also email Todd. Just remember that he might not be able to answer your email as it appears he's getting inundated with support which is fantastic news. Plus he's still involved in lots of technical weather discussions with people that are really, really into meteorology. Just knowing that Todd's got my back is already making this a great 2006.